HAVANA (AP) — The Trump administration is moving to end a deal allowing Cuban baseball players to sign contracts directly with Major League Baseball organizations. The change will once again require Cuban players to cut ties with their national program before signing with MLB. The Treasury Department told MLB attorneys in a letter Friday that it was reversing an Obama administration decision allowing the major leagues to pay the Cuban Baseball Federation a release fee equal to 25% of each Cuban player’s signing bonus. The decision made public Monday afternoon appears to make the MLB-Cuba deal unworkable by eliminating the payment mechanism, similar to one MLB has with leagues in China, Korea and Japan. The MLB and Cuba engaged in intense negotiations on a player-transfer deal through the Obama administration’s two-year effort to normalize relations with Cuba but the deal was only finalized after Donald Trump took office pledging to roll back Obama’s policy. Opponents of normalization inside and outside the administration argued for its cancellation as soon as it was announced, and appear to have now succeeded. U.S. law prohibits virtually all payments to the Cuban government under the 60-year embargo on the island but MLB argued the Cuban Baseball Federation, which oversees all aspects of the sport on the island, was not formally a part of the Cuban state. Opponents called that argument ridiculous given the tight control the highly regimented government maintains over virtually every aspect of life in Cuba. “We stand by the goal of the agreement, which is to end the human trafficking of baseball players from Cuba,” an MLB statement said. Without a formal path from Cuba to the major leagues, hundreds of top players have left the island for good, many making harrowing crossings on rafts and rickety boats in the years before Cuba abandoned a hated exit permit requirement for most of its citizens. While such dangerous escapes were mostly eliminated with greater travel freedoms, players still needed to cut ties with Cuban baseball and often their families and hometowns, going years without returning after signing with the major leagues. Last week the Cuban federation released its first group of players able to sign contracts directly with Major League Baseball organizations, and some expected to be playing in the United States this year. The 34 players were 17 to 25, classified as international amateurs under MLB rules and eligible to sign minor league contracts. No likely stars were apparent on the list, but more notable players included 22-year-old Raidel Martinez Perez and 23-year-old Liván Moinelo Pita, who have played professionally in Japan; 17-year-old infielder Loidel Chapellí Zulueta; and 18-year-old pitcher Norge Carlos Vera Aldana. 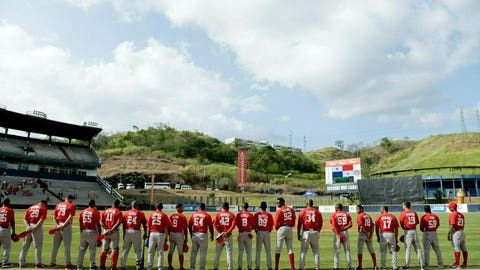 The Cuban federation also agreed to release all players 25 and older with at least six years of professional experience to be classified as international professionals under MLB’s labor contract with the players’ association and not subject to international amateur signing bonus pools.